Since 1994 Gaming Club Casino has been using the Microgaming platform to deliver quality upscale gaming to players all around the world. Licensed and fully regulated in Gibraltar, players can expect to be treated fair and right every time they log onto play. Their software is perfect for players worldwide as it’s available in a number of languages in currencies, including CAD. Gaming Club must be doing something right to be in the business for all of these years, and today they are still going strong with a near flawless reputation. As part of the Belle Rock Group of casinos, which are accredited across numerous online gaming portals; players can expect second to none gaming. Over 500 games are available in a short download, however; for those players looking to get into the action sooner, there is an instant play version of the casino readily available. The flash version is perfect for Mac users; however it doesn’t host as many games as the download client. Microgaming has the most popular casino games online, and all of them are found at Gaming Club, including the massive progressive jackpot games. The games menu is neatly organized and players will find slot games, of all variety, and table games that mimic those found on a Vegas casino floor. The video slot section accounts for more than 220 of the games on offer, and most of the slot games on the menu are rewarding and exciting. There are themes for just about everything, and no slot lover would be without entertainment. The specialty games selection is perfect for those players looking for a little change in pace. Keno and multiplayer games are there for the choosing should the player want something different to quench their online gaming thirst. New games are always being added to the lobby so keep your eye out for the latest releases. Promotions and bonus offers are impressive at Gaming Club and upon sign up new players are given 100% and 150% bonuses on their first and second deposits. There are also a host of other ongoing promotions and loyalty rewards and all you have to do to be eligible is play at the casino. The terms and conditions are transparent and can be found on the website. 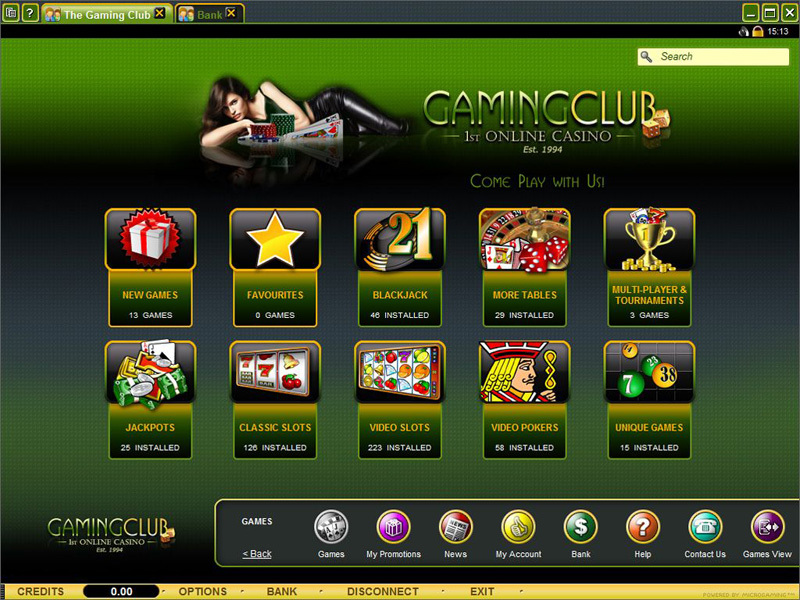 The VIP scheme is also rewarding and the most noble of Gaming Club players are given the VIP treatment. As soon as you wager a real money bet inside the casino, you are able to become and VIP and start climbing your way to the top. Also, loyalty points are earned and the more you play, the more you will receive. To get started playing at Gaming Club, players must make their first deposit which is simple and secure. Using the most trusted funding methods in the business, all transactions are completed in minutes. Players can use such methods as Visa, MasterCard, Instadebit, EcoCard, Moneybookers, Paysafecard, Ukash and Neteller, just to name a few. All transactions are encrypted to protect player’s privacy and the security team works hard to keep players sensitive financial information safe. The currencies available are USD, CAD, GBP and EURO. If you have questions regarding the banking center, or any other aspect of the casino, you can contact support 24/7 through the live chat directly from the website or casino. Also, email and telephone support is available should you prefer those methods instead.